Did you guys know that “normal” is a statistical concept? Generalizing past the technical statistical usage, it basically means “common”, or “usual”. Check it out. Sure, a dictionary is a book of history, not law, but realizing that the term can exist without connotations of value (ew, you’re not normal!) can be quite liberating. For example, both ends of the IQ scale could be said to be “abnormal”, making both geniuses and (insert current low-IQ term here) “abnormal”. But why do we give such positive value to the idea of “normal”? Social psychology provides a clue: one of the worst things that can happen to a person is to be shunned — by classmates, by work team, by members of the club, by the tribe. To be normal is to resemble the group — to be included. To be abnormal is to risk being shunned. Thus “normal” = “good”, in a social sense. In the end, though, knowledge is power. If we become aware of the statistical meaning of “normal”, and the power of shunning, we may transcend them. This is film geek fun. 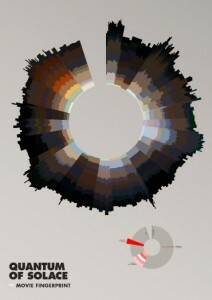 Frederic Brodbeck has created a way of summarizing films graphically. He analyzes a DVD, and creates what is basically a thick, open-ended circle to represent the movie, its length, its color palette and the amount of action on the screen at any given interval. The comparison between 2001: A Space Odyssey and Aliens is cute. 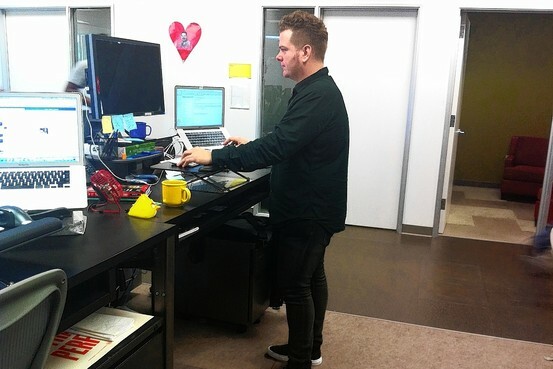 Check it out: http://cinemetrics.fredericbrodbeck.de/ Hey, buy a poster. Yep. It’s been a while. I apologize for going underground again, but I’ve been busier than I’ve ever been, with school, teaching, and work. Sadly, this blog has taken a back seat to, well, life. But then I said, “screw it”. Other bloggers post more often with less. So let’s try that. The “more often” part, anyway. I’m taking a few courses at U of T this fall, and one of them is Visual Studies. It’s interesting to see where the course fits into the continuum of art courses, especially since this is part of what was a Studio, not History program. But more to the point, it’ll be interesting to see how the course defines art, and where it fits into another continuum of old pretty stuff versus new weird stuff. Well, we started with a definition of Art. Not art mind you, but Art. Sure, they respect the term regarding the art of cooking and the art of motorcycle maintenance (for example) as referring to skills, discipline and so on. This usage is pretty old, and used to be applied in academic circles to all kinds of technical stuff that we wouldn’t call very artsy today. Yes, the Professor acknowledged the history of the word, but then brought us into the present. She showed us a number of works of art, then asked us which were Art, and which were not. 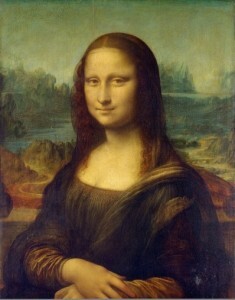 I won’t bore you with the details, but stuff like Leonardo’s Mona Lisa and the Sistine Chapel ceiling weren’t Art, though they are beautiful. 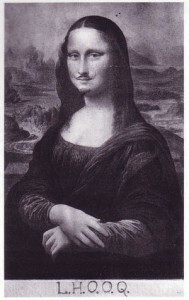 Nope,if you’re looking for Art, look for Duchamp’s Mona Lisa with a mustache, Warhol’s can of Campbell’s soup, and (there he is again) Duchamp’s “fountain” urinal. Being (mostly) young students, we were not offended by this, but more intrigued by the nature of the lesson. Not Art? But we thought that was Art! How are you going to get out of this one, Prof? Its creative direction must come from the Artist, not from a patron. This is a reflection of the breakdown of the traditional patronage (the Church, royalty) of the past. This kills the Sistine Chapel, since Michelangelo didn’t want to do it. He preferred sculpture, but you don’t refuse your patron. This definition also came about as a result of the French and American revolutions, which exalted the power of the individual. All were now equal, but with equal chance to become starving artists. The piece must pass through the Art community, and be valued as a work of Art. This is a little circular, but goes to credentials, I suppose. It means that my Uncle Charlie can try to drag his 1948 Harley out of the garage and call it a work of Art, but unless the Art world agrees, it ain’t Art. The piece has to have no useful purpose. This requirement can be a little gray in some cases, but it prevents someone from putting a screwdriver on a pedestal and calling it art. Maybe it also explains why some artists make things that look just like the real thing, but out of an unexpected material, say, they might make an exact copy of a bathtub out of minty filling. A dinosaur made of chairs would have no useful purpose, though each chair might. This also means that many ancient artifacts are not Art, because they were made with a purpose: to direct religious ceremonies, or provide a focus during meditation. I hope that makes sense. It doesn’t mean that all the old stuff is less beautiful, but I think it does open up the idea of Art to a lot of things previously thought to be weird or stupid. It makes it more interesting to discuss works of Art with regard to intention, context and so on. 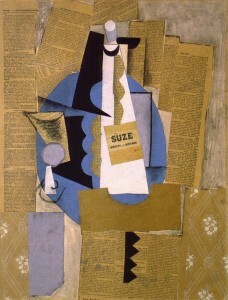 For example, picture a Picasso, such as the one at left, Glass and Bottle of Suze. We might be dulled to its impact, because we’ve seen so many parodies of the style, and we’ve seen everything that has come after (especially in graphic design), having been influenced by it. But if we look into the context of the time (1912), where Western paintings were all done using conventional, realistic perspective, that flattening the plane and unfolding objects was extremely radical. It’s also interesting to note that the camera was popularized around this time, freeing artists from making paintings that looked like photographs at some level. Here’s my point: by understanding this definition of Art and allowing ourselves to discuss it at a level beyond our idea of beauty, we can look at it as a series of historical, social and psychological documents, giving us some insight into how we as viewers think, and how artists create. It’s all quite interesting, no? Refine and Repeat really works! I’ve been playing amateur-level trumpet for about (cough) thirty years now, but the greatest improvement in my playing might have happened in the last few months. Why? 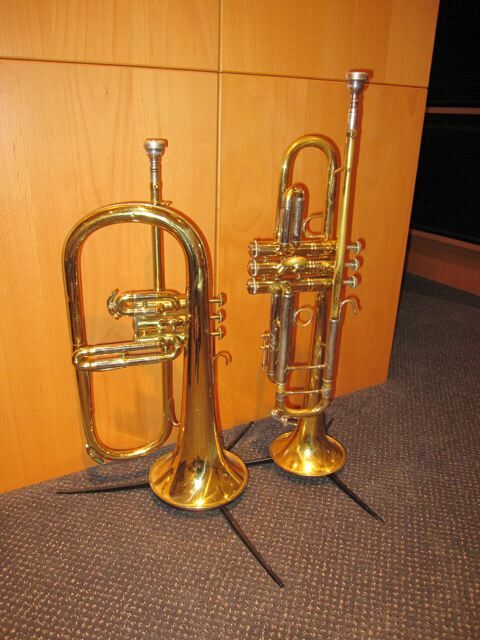 Because I’ve placed my trumpet and flugelhorn, out of their cases, in the path to my desk at home, so about every other time I walk past them, I play one of them. There’s the repeat. As for the refine, I can recall the words of Chase Sanborn, from whom I took a lesson a few years ago: make sure every note is played well. To that end, when I play a rough note, I stop, go back a bar or two, then play it again, but with attention to technique this time. As a result, my intonation (pitch) is better, my articulation (attack & release) is sweeter. Since I’m getting more comfortable on the horn, I’ve also been able to rise above basic technique on occasion (see here and here), relax and occasionally get melodies out of my improvisation. Hey, flashes of adequacy! Of course, I still need to work on consistency, repertoire and unfamiliar chord changes, but I’m actually starting to sound like someone worth listening to on occasion. That’s the thing isn’t it? Maybe you can play the darn thing, but would anybody sit and listen to you?